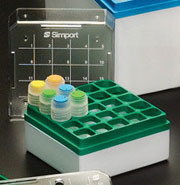 COLOR YOUR WORLD with a wide variety of Cryostore™ Storage Boxes for vial sizes from 1.2 ml to 5 ml. Made of extra strong polycarbonate, these durable cryogenic storage boxes are designed to be used at temperatures between -196 °C and +121°C and are autoclavable at 120 °C, 15 psi (1 bar) for 20 minutes. Different models are available to accommodate either 25, 81 or 100 Cryovial® tubes from 1.2 ml to 5 ml. A transparent cover allows the user to see the contents of the box, and is keyed to the base to prevent misalignment. Being printed with a series of squares (numbered from 1 to 25, 1 to 81, or 1 to 100), the surface accepts writing with markers, facilitating inventory control. A unique color coding system uses colored plastic grids to separate the cover from the base on the 25 and 81-place boxes.The ones made to accept 100 tubes have a colored base instead of a grid. Removal of vials facilitated by an innovative vial picker supplied with each storage box. A choice of four popular colors is available.